We’d love your help. Let us know what’s wrong with this preview of Roses in the Dragon's Den by Jacob Devlin. Twelve year old siblings Karina and Charlie Rosas aren't looking forward to vacationing with their estranged uncle. But when the Fernweh Express derails and tosses them into a wild, unrecognizable land, they trust he'll know what to do. After all, Diego Rosas wrote the book on survival in deserts and arctic tundras. There's nothing he can't handle . . . until a colossal, f Twelve year old siblings Karina and Charlie Rosas aren't looking forward to vacationing with their estranged uncle. But when the Fernweh Express derails and tosses them into a wild, unrecognizable land, they trust he'll know what to do. After all, Diego Rosas wrote the book on survival in deserts and arctic tundras. There's nothing he can't handle . . . until a colossal, fire-breathing dragon snatches him up and carries him away, leaving the siblings to embark on an impossible rescue mission. 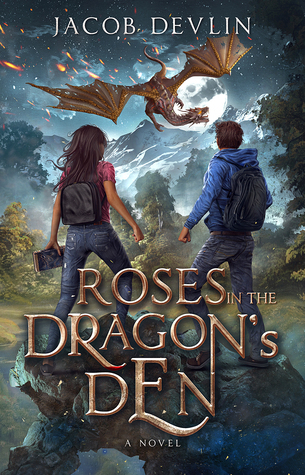 To ask other readers questions about Roses in the Dragon's Den, please sign up. Karina and Charlie Rosas are the primary main characters, teenagers on a European holid Boy, do I have a treat for you guys, today–an advance review of a book still available for pre-order, here! I had the privilege to read an ARC of Roses in the Dragon's Den. This book was SO MUCH FUN!! Family. Adventure. Magical worlds. Pirates. Well-written villians! Dragons! The adventure was non-stop from page 1. Jacob Devlin did an amazing job keeping me turning the pages. I loved the family dynamics between Uncle Diego and the twins, and their quest to take care of each other no matter what . . . even if "Here there be dragons!" Devlin's voice really shone with this story. I can't wait to find out I had the privilege to read an ARC of Roses in the Dragon's Den. This book was SO MUCH FUN!! Family. Adventure. Magical worlds. Pirates. Well-written villians! Dragons!